India were in real danger of being knocked out of the Champions Trophy after a heart-breaking three-wicket defeat tonight at the hands of title holders West Indies who became the second team to qualify for the semifinals. South Africa gave a convincing display notching up a runaway win over Sri Lanka in their previous match of the Champions Trophy. A flamboyant Punjab outplayed Karnataka 4-2 in the knockout round of the 62nd National Hockey Championship at the Olympian Surjit Hockey Stadium here today. In another knockout match, Mumbai whipped Chhattisgarh 6-1. Punjab will host the 63rd National Hockey Championship, said Mr S.S. Virk, president of the Punjab Hockey Association (PHA), while addressing a press conference during the ongoing 62nd edition of the tournament at the Olympian Surjit Hockey Stadium here today. Fancied Railways and Chandigarh today qualified for the super league in the 62nd National Hockey Championship being played at Guru Nanak Dev University stadium. Indian Airlines and Delhi reached the super league after registering wins in the pre-quarterfinals of the 62 National Hockey Championship being held at the Satguru Partap Singh Astroturf Stadium here today. Fifteen-year-old Sharmila Nicolette virtually brought a birdie out of the forest in the 16th hole as she stormed her way with a score of 73 to tie with seasoned Shruti Khanna for the lead on the penultimate day of the 14th Punjab Open Ladies Amateur Golf Championship at the Chandigarh Golf Club here today. The Caribbeans first restricted India to a modest 223 for nine and then managed to overhaul the target with just two balls to spare in a thrilling floodlit Group A contest which went down to the wire. The West Indies were cruising along comfortably at 212 for three before the home team staged a valiant fightback by scalping four wickets in the last five overs to raise hopes of a miraculous escape. 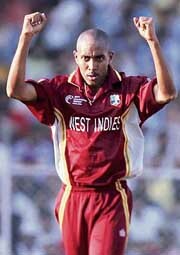 But, with four runs required off the last three balls, middle-order batsman Marlon Samuels smashed a wide delivery from Ajit Agarkar to the point fence to see the Caribbeans through, much to the dismay of the viciferous home crowd at the Sardar Patel Gujarat Stadium. The Indians will now take on the mighty Australians against whom they face a must-win situation to keep themselves alive in the high-profile tournament, a task which appears extremely daunting considering their form. The West Indians have garnered four points from two matches so far while India and Australia have two points each from as many matches. The Caribbeans owed their victory to a disciplined bowling show and responsible batting performances by Shivnarine Chanderpaul (51), Ramnaresh Sarwan (53), Runako Morton (45) and Chris Gayle (37). Earlier, Mahendra Singh Dhoni’s late pyrotechnics helped India post 223 for nine. Dhoni struck 51 down the order as India struggled on a slow track against some tidy bowling by the West Indies. Dhoni’s 65-ball knock helped the hosts break the shackles after being tied down to 164 for six by the 42nd over and plunder 59 runs from the last eight overs. Captain Rahul Dravid scored 49, while Sachin Tendulkar (29) and Yuvraj Singh (27) were the other notable contributors for India whose batsmen could never really dominate the Caribbean bowling. Ian Bradshaw led the West Indian attack with 3-30 and was well-supported by Jerome Taylor (2-33), Dwayne Smith and Marlon Samuels. Fall of wickets: 1-22, 2-27, 3-69, 4-130, 5-131, 6-164, 7-213, 8-223, 9-223. Bowling: Taylor 10-2-33-2, Bradshaw 10-0-30-3, Smith 10-1-37-0, Bravo 7-0-51-0, Samuels 9-0-35-1, Gayle 4-0- 34-0. Fall of wickets: 1-43, 2-100, 3-120, 4-212, 5-218, 6-219, 7-219. South Africa gave a convincing display notching up a runaway win over Sri Lanka in their previous match of the Champions Trophy. Their bowlers were particularly clinical and dismissed the mighty Sri Lankan batting for a paltry 141, hurtling them to the bottom of the table in Group B. The display should be a cause of concern for the unpredictable but dangerous Pakistan as the two sides clash for the second semifinal slot in the Champions Trophy day-night match at the PCA Stadium here tomorrow. Led by Graeme Smith, the South Africans look like a well-oiled machine. Their pace attack led by irresistible Shaun Pollock and backed by Makhaya Ntini, Andrew Nel and Jacques Kallis proved too potent for the Sri Lankans. Pollock has repeatedly proved that despite advancing years, he has lost none of his wicket-taking abilities. In the previous match, the former South Africa skipper was miserly with the ball, besides providing his team crucial breakthroughs. Pollock’s ability with the willow has served the South Africans well. In Kallis, they have an all-rounder any skipper would love to have in the team. Besides being the most experienced and dependable batsman, Kallis has been performing the role of a regular bowler with remarkable ease. 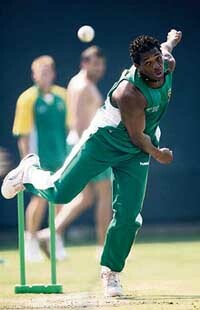 The presence of the two peerless all-rounders in the side provides South Africa enough flexibility. It will be a test of character for the relatively inexperienced Pakistan bowling attack. Assertions of the coach Bob Woolmer notwithstanding, the current set of pacemen are not in the same league as Shoaib Akhtar and Mohammad Asif. They have done well for the team in the Champions Trophy matches so far. But the Mohali wicket, which has the reputation of being conducive to strokeplay after the initial 10-12 overs, would be a test of character as well as skill for them in view of the strong batting line-up of South Africa. Herschelle Gibbs has an enviable reputation as a hard-hitting batsman and can be destructive on his day. Smith, Mark Boucher and Boeta Dippenaar can be tough to contain, while AB de Villiers, who top-scored in team’s victory in the last match against Sri Lanka, has been making rapid strides as a dependable batsman. But any team taking Pakistan lightly should be doing so at their own peril. Skipper Younis Khan did not look perturbed on the eve of the crucial contest and said if his players played to their potential, there should be no problem for Pakistan moving into the semifinal. New Zealand yesterday caused a flutter, defeating fancied Pakistan to emerge the first team from the group to gain entry into the semis. A cracker of a contest is in the offing as the battle for the second semifinal berth takes place tomorrow. The teams (from): South Africa: Graeme Smith (captain), Loots Bosman, Mark Boucher, AB de Villiers, Boeta Dippenaar, Herschelle Gibbs, Andrew Hall, Jacques Kallis, Justin Kemp, Charl Langeveldt, Andre Nel, Makhaya Ntini, Robin Peterson and Shaun Pollock. Pakistan: Younis Khan (captain), Mohammad Yousuf, Abdul Razzaq, Faisal Iqbal, Iftikhar Anjum, Imran Farhat, Kamran Akmal, Mohammad Hafeez, Rana Naved-ul-Hasan, Shahid Afridi, Shoaib Malik and Umar Gul. “International sides are used to playing back-to-back matches. It is the same with other teams. We have no complaints on this count,” Younis said categorically when asked about the pressure of Pakistan having to play back-to-back matches against New Zealand and South Africa. Younis, who failed to contribute with the bat in the first two games of the Champions Trophy, denied that addition pressure of captaincy was taking its toll on his performance as a batsman. “I have captained the team earlier and produced results. I am confident of doing it again,” he said. Refusing to panic in the do-or-die contest against South Africa, Younis said if the team was able to play as well as it did in the first match against Sri Lanka, they would sail into the semifinals. He said the conditions at Mohali wold be different to those in Mumbai and Jaipur and he was looking forward to the contest. Kallis, who had sprained his ankle while practising, had recovered well and was ready for the contest. Punjab and Mumbai have now entered the super league stage of the tournament. Four groups of three teams each will be announced tomorrow. Spirited boys of the host team faced a tough competition from Karnataka, who were very good in defence. Jarnail Singh, playing his first nationals, emerged as the star of the day with goals in the 13th and 36th minutes. Another goal in the 34th minute by Amit Singh was also set up by Jarnail. Jarnail, an employee of the Rail Coach Factory, Kapurthala, scored both goals through reserve flicks. The first one for Jarnail had come off a long pass by Prabhdeep Singh, who foxed at least three Karnataka players before passing the ball. Amit Singh converted a penalty corner in the 55th minute. Appanna, Karnataka’s star player in the tournament, scored both goals for the losers. Punjab led 2-0 at the half time. Punjab missed two very close chances. The ball hit the top of the poll on a flick by Baljit Singh Dhillon in the opening minutes. A push by Jarnail Singh in the first half hit the corner of the goalpost and deflected outside. Ace drag-flicker Jugraj Singh was a disappointment for Punjab as he failed to convert any penalty corners. Chhattisgarh gave anxious moments to Mumbai when they levelled the score in the 24th minute through a field goal by Fujail. Stanley Fernandes had scored for Mumbai in the 13th minute. Mumbai later struck in the 28th, 35th, 37th, 48th and 67th minutes. The scorers were Vikas Pillai, Nilesh Mane, Jayesh Jadhav, Hemant Lethe and Shakti Thakur. Starting with the super league, which begins on October 28, all the remaining matches of the championship will be held at Jalandhar. Giving details, Mr Virk said in the next edition six zonal centres in the country would shortlist two teams each for the national championship. At least four associate members will also be invited to participate in the championship, which like this year, will be decided at an alternate venue. “The idea of zonal centres has been worked out to reduce the pressure on the organisers as well as the participating teams in the terms of time and money,” he said. The PHA also announced club tournaments in the state in order to promote local talent. District-level championships are the first step towards this direction, he added. Mr Virk agreed to the financial constraints in promoting the Indian hockey. “We are receiving positive response from certain private parties, including NRIs. I promise no miracles, but the developments are positive”. “Punjab is working on more Astroturfs in the state and the venues under consideration at the moment are Mohali and Ropar and Jalandhar. Public response to the Premier League matches was very encouraging and it clearly means that the sport has potential for public fanfare. The matter only needs to be handled in a fresh perspective,” he added. N.S. Sodhi, coach of the Chandigarh team, has been suspended for one match because of professional misconduct during a match with Orissa yesterday. Confirming the development, Mr Kukoo Walia, Tournament Director, said Orissa players had complained of professional misconduct, which was confirmed by the match referee. The coach will sit out of the match area in the next match following which an explanation will be sought. Orissa boys went down fighting 2-0 to the strong Railways team. The Railways notched up their first goal through penalty corner in the 32nd minute through Harish Kumar. In the 57th minute, Rajnish Chaturvedi converted a penalty corner. Chandigarh and Patiala produced some excellent hockey with the former winning the tie 3-0. Chandigarh opened his tally in the 16th minute when Sukhbir converted the penalty corner. The second goal also came through a penalty corner when Navdeep sounded the board in the 42nd minute. In the 52nd minute, Ravi Paul of Chandigarh dribbled his way past Patiala defenders to score the third goal. In the first match, Indian Airlines drubbed Uttar Pradesh 7-1. It goes to the credit of the losing side that they managed to hold their ground in the first half against the more experienced Airlines team, which comprised of seven Olympians and four international players. The teams were tied 1-1 at half time. The Airlines team got its act together in the second half, which saw some brilliant stick-work by the winning side. Drawing on their vast experience and some good passes by Dhanraj Pillai, the winners steadily increased their lead and at the end of the game they were ahead by six goals. The first to strike was Lazarus Barla (8th) followed by Bimal Lakra in the 40th minute. Captain Sameer Daad (43rd and 67th minutes), Sandeep Michael (56th min) and Rajnish Misra (64th and 69th minutes) were the other scorers. The lone scorer for UP was Mohsin Sayeed who scored a field goal in the 26th minute. In the second match, Delhi outplayed Jharkhand 9-1. This too was an uneven contest, as the more experienced Delhi side struck at will and dominated both halves. Jharkhand seemed to have lost their cohesiveness as a team right from the beginning and were uphill all the way. For Delhi, Damandeep, Vikas Toppo, Jitender Saroha struck twice each, while Pramod, Sukhpal Singh scored one goal each. The lone striker for Jharkhand was Arvind Kumar who struck in the 21st minute. A Class X student of Bangalore International School, Sharmila started badly with four bogies (one a double) in the first nine. A slight compensation in the form of two birdies gave her a first half score of 39. But, in the return nine she was a person possessed. And this was amply demonstrated in the 16th hole when she ended up in the forest. She did not lose her cool in the five-par hole. Some good pitching and putting saw her ending up with a birdie on that hole. And with another birdie on the 17th hole, she played a two under in the return nine to finish with a card of 73. Young Nitika Jadeja, however, emerged as the star of the day returning a par card of 72. She finished three strokes behind the joint leaders. Madhu Brar wrapped up the senior challenge to clinch the title with a four-stroke lead over her nearest rival S. Ratia. In the sub-juniors, Karishma had reserved her best for the last and took the shield with a gross score of 256.The nett shield in this division was clinched by Jaipreet Ghuman on the basis of a better back nine from Khusbhoo. The scores (after three rounds): Championship Bowl: Sharmila Nicolette 74+82+73=229, Shruti Khanna 73+79+77=229, Nitika Jadeja 82+78+72=232, Saaniya Sharma 78+77+81=236,Vandana Aggarwal 77+79+83=239. Silver Salver (nett scores): Nitika Jadeja 214, Pauline J.M. Singh 216, Shweta Galande 219. Challenge Bowl (handicap 13-24): Gross — Karishma Thiagaraja 256, Sonali Chibber 271, Khushboo Thiagaraja 273; Nett — Khushboo Thiagaraj 216, Karishma Thiagaraja 217, Binny Bath 217. Bronze Plate (25-36): Gross — Amrita Sarna 303, Neelu Chopra 316, Kanak Lata 316; Nett — Jaipreet S. Ghuma 216, Amrita Saran 219, Kiran B.M. Singh 223. Junior Shield (under 18): Gross — Sharmila Nicolette 229, Mani Chander 245, Shweta Galande 249; Nett — Khushboo 216, Jaipreet Ghuman 216, Karishma 217. Sub-junior Shield (under-14): Gross — Karishma 256, Mehar Atwal 260, Shreya Ghei 263; Nett — Khushboo 216, Jaipreet Ghuman 216, Karishma 217. Senior Challenge: Gross — Madhu Brar 279, S. Ratia 283, Binny Bath 286; Nett —Binny Bath 217, Dalbir Sahi 221, Kiran B.M. Singh 223.